I updated to iOS8 and now I cannot search, what gives? Yes, there is a bug in iOS8 that I currently have a fix into Apple for review. It should be released soon. I am in agony waiting for Apple to review the app. Temporary workaround: The problem lies in the fact that the iOS8 search bar is ignoring my request for no capitalization. So you will notice the word you are searching for is capitalized. Just make sure the first letter is lowercase and it will work as usual. I hate the animated flip on Flash Card Mode, can I do away with that? In version 1.3, if you wish to do away with the flip on Flash Card Mode when you tap simply click on MORE -> Mechanics then NO for 'Animate Card Flip'. Can I see more than just the Top 75 word lists? Yes, in version 1.3: New TOP word lists! Many have been asking for more than just the Top 75 words. Now we have Top 75, Top 76-150, Top 151-225 and so on in 75 word lot increments. The DEFAULT is Top 75, to change lists click MORE then under MISC heading click Top List Options. From then on you will see this list as your TOP option. Can you make the English come first in Flash Card Mode? Yes, when in Flash Card Mode simply click the 'English First' button as shown below. To return click the same button. Can I create my own subset of words for flash cards? 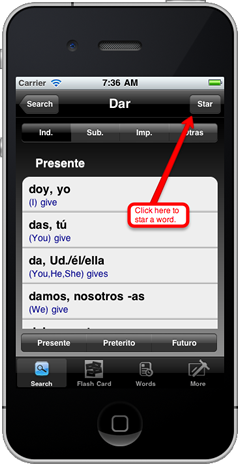 Yes, when on the verb conjugation screen click the 'Star' button. Then in the Flash Words screen click 'Starred'. 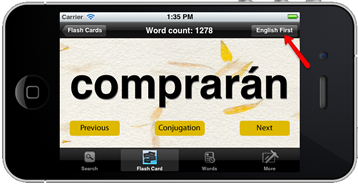 Why does it appear that some of the Spanish words in Flash Card mode are wrong or misspelled? 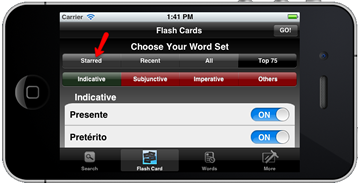 We receive lots of complaints that say that the Spanish words in the Flash Card mode are wrong and misspelled, but which turned out to be the correct Spanish words in the SUBJUNCTIVE mood. It is easy to assume there is an error in the Spanish provided if you are thinking of words that are familiar to you that happen to be in the INDICATIVE mood. Remember there are four main MOODS in Spanish, the most common that you and I use and think of usually is the indicative mood. One hundred percent of the time ( so far ) that we have gotten a complaint about an incorrect flash card showing it is just showing you words in the SUBJUNCTIVE mood, when one might be expecting words in the INDICATIVE mood.